Chico King: Pale Ale (Beer Camp Across America) | Sierra Nevada Brewing Co.
3 Floyds has a reputation as the Midwestern kings of alpha (hops), and it seems that one of our beers helped to lure them down the lupulin-paved path. Chico King is a mash-up of our mutual passion for hoppy pale ales and combines a uniquely robust malt body with intense citrusy and fruity new school hop varietals. 3 Floyds marches to the beat of their own (double kick) drum when it comes to collaboration, often partnering with comic book artists, tattoo parlors or heavy metal bands when inspiration strikes. These eclectic beers are coveted throughout the Midwest and some beers, like the legendary Dark Lord Imperial Stout, have spawned something akin to a beer-themed holiday in the brewery’s hometown of Muenster, IN. Had this for the first time at the Beer Camp Across America event in Chico. Cool orange appearance and about 1.5" of white head. Aroma was hops, but not as pungent as you might think these two breweries could make together. Taste is reminding me of SNPA in a big way, a little less Cascade hop and crystal/caramel malt, but the underpinnings still seem to be there. The hops here are more fruity, less bitter, less aggressive, the body is just as sweet but not as thick. Its not quite a blend of SNPA and Alpha King, but those are definite starting points that you can feel in this one. Seems like the malt bills are pretty similar, hops though are very different and more fruit forward here. Reviewed from (very long-standing) notes. Consumed in late 2014. Poured from a 12 oz. bottle into a Cigar City Brewing pint glass. A: Pours a medium to dark gold, just a bit hazy. Forms a couple finger's of white head that lasts for a good while with average visible carbonation. S: Resin with floral and grassy hops. A cracker malt body. Not a big aroma overall. T: Follows the nose – grassy and floral hops, a touch of citrus rind. A hefty malt base for an APA, and one that comes across as quite bready. Light bitterness lasts into the hang. S: Medium body, with good carbonation sensation. The alcohol seems a little prominent for the style. O: Nothing offensive in the way of an APA, but absolutely forgettable. Nothing to make this stand out at all. Bottled 5/15/14; drank 7/16/14 @ the Yarchives. HUGE eggshell head (careful pouring! ); a curtain of lace. Ham, mild toffee & acrid smoke nose?! Gross; I'm worried. Pickle juice flavor with mild mango lurking in the shadows somewhere. Barely drinkable. Pours out to a slightly hazy burnt orange. Thin layer of silt at the bottom of the bottle. Forms a thick large meringue style yellow head with beautiful retention and thick lacing. The nose is probably a bit muted from it's original form as this is a bit old, but has a touch of kiwi fruit, tropical fruit and subtle pine and floral. Mouthfeel is a bit prickly, not too acidic, medium bodied. Taste of kiwi, a touch of biscuit malt?, a bit grainy and husky, medium firm bitterness, kiwi floral is the best way to describe it. No pineapple, mango or cat pee here. Finishes dry. A decent pale ale with it's own character but it doesn't do a lot for me. Aroma is yeast, citrus, mild spices and white bread. The flavor is citrus, white bread, malts, slight heat and a mildly bitter finish. Clear, bright amber coloring, lush, creamy head, leaving lace, looking lovely. Aroma: spills out of the glass. Floral, spicy, citric. Delicate and glorious. Taste: Mmm, bitter. Mmm, fruity. Not too much this, not too much that, in every way a triumphantly hopped pale ale, not an overdone IPA. Lush, plump sweet malt keeps it all together. Balance is key here. This is no monster, no imperial anything. It's just a big bunch of yum, is what it is. I want to know more, so I'm peeking at the label: "This pale ale packs plenty of bright, fruit-forward resinous hop varietals above a robust malt body." That's the bottleneck. Now, the back: "3 Floyds has a reputation as the Midwestern kings of alpha (hops), and it seems our flagship beer helped lure them down the lupulin-paved path. Chico King is a mash-up of our mutual passion for hoppy pale ales and we suspect you'll find it fit for royalty." So, what is it? It's not SNPA, and it's not Alpha King, but it's somewhere in between. And to tell you the truth? I'd rather have the others. This mash-up doesn't make a better beer. It's good, don't get me wrong, it's just not better. Sampling a cellar temp 12 oz bottle poured into a snifter. The beer gives a frothy fluffy head of 2 cm foaming up. The head is just a hint off from white with a bit of yellow mixed in. Gradually fades to a partial surface layer and leaves some sticky lattice on the glass. Aroma is apparent on the pour with some crisp bold pine sap and a bit of citrusy fruit. Bold nose on this beer. The first sip reveals a silky smooth texture and average body with fine tingly carbonation that tickles my palate on each sip. Flavor is briefly caramel and toffee but quickly rolls to some aggressive hop notes, this isnt a bitter bomb though. I get pine sap again and some grapefruit rind with a bit of lingering astringency but not like sucking on an aspirin. There is no hint of alcohol and the beer is crisp and drinks very easy. A nice example of the style, id drink it again. 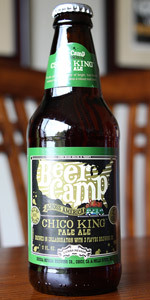 Chico King: Pale Ale (Beer Camp Across America) from Sierra Nevada Brewing Co.